I have read many reviews in forums online discussing problems with setting up the Xbox Kinect correctly. The instructions for set up are pretty straight forward, but it is finding the optimal placement for the Kinect that troubles many. The Kinect must be two to six feet from the floor and on a stable surface. I dug through reviews and forums and was never able to find a perfect solution. But a new shelf that "floats" beneath the television turned out to be the ideal fix for my floating shelf. The Xbox Kinect does create a new way to interact with video games, but it requires space to do so. If you have your television mounted to the wall, you are halfway there. But what about the bulky stand that houses your game system and other components? To solve this problem, I replaced my tv stand with a floating shelf. The floating shelf set up only a few minutes and no tools were required. 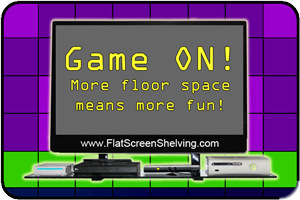 Not only did this free up floor space, but the 48" shelf allows for placement of three components and also the Xbox Kinect. Now with my Xbox Kinect placed directly underneath the television on a thick, glass surface and plenty of floor space to move about in, I am enjoying my Xbox gaming system like never before. With great games like Kinect Sports and Dance Central, and the ability to play hands free, has put the Kinect above the competition. Having the Kinect at tv set up with a floating shelf is really the best way to go.